Equatorial Guinea's (Republica de Guinea Ecuatorial) President Obiang Nguema Mbasogo celebrated the National Day of Equatorial Guinea in Shanghai, China at the Shanghai Expo 2010, his second stop of his official visit to Asia. 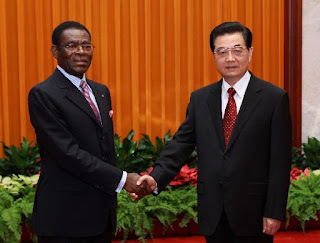 Chinese and Equatorial Guinean government officials gathered to celebrate the excellent relations that exist between the two countries and the development that Equatorial Guinea is experiencing. The celebration began with remarks by the Director of the Chinese General Customs Administration, Sheng Guangzu, in which he reiterated the prosperous relationship that exists between both countries. President Obiang congratulated the Chinese authorities for the invitation to the event and for their steadfast support of his country. President Obiang also explained that the exchange of experience with countries like China, particularly in the area of technological development, is important and beneficial to his country. Visitors toured Equatorial Guinea's national pavilion at the Expo, which featured the concept of "sustainable beauty of the city" as a central theme of the country's development plans and efforts in three parts: seaside scenery, energy exploitation and utilization, and urban future. It included visuals of Bioko Island, Pico Basile, and examples of Spanish architecture and Guinean culture. Equatorial Guinea's government is working to foster urban development and ecological sustainability. As part of the Horizon 2020 plan set forth by President Obiang, hefty investments are being made in all areas, including infrastructure development, social services, and environmental protection. After passing through the Shanghai Expo, President Obiang visited the city of Beijing, where he met with his Chinese counterpart, Hu Jintao, and held several meetings with businessmen in the country. The President also expressed his condolences for the recent disaster in the province of Gansu, where flooding has caused landslides and mudslides that have caused numerous deaths.